Loretta Lynn "Lorrie" Morgan (born June 27, 1959) is an American country music singer. She is the daughter of George Morgan, a country music singer who charted several hit singles between 1949 and his death in 1975. Morgan charted her first single in 1978, although she did not break into the top of the U.S. country charts until her 1989 single, "Trainwreck of Emotion." Since then, she has charted more than 25 singles on the Billboard Hot Country Singles & Tracks charts, with three number one hits: "Five Minutes," "What Part of No" and "I Didn't Know My Own Strength." She has also recorded more than 15 studio albums. At various points in her life, Morgan has been married to three different country singers: Keith Whitley, Jon Randall and Sammy Kershaw. She has sold over 6 million records worldwide. Morgan was born in Nashville, Tennessee, and made her first appearance on the Grand Ole Opry at age 13, performing Fred Spielman and Janice Torre's "Paper Roses." After her father died in 1975, she took over his band at age 16 and began leading the group through various club gigs. Within a few years she disbanded the group, and in 1977 she joined the Little Roy Wiggins band. She then became a receptionist and demo singer at Acuff-Rose Music, where she also wrote songs. In the late 1970s, she was the featured vocalist on a morning television show hosted by Ralph Emery, on Nashville's WSM-TV (now WSMV); Emery was a longtime friend of her father, who appeared on Emery's Opry Star Spotlight, an overnight music and interview show that ran for many years on WSM-AM. Morgan had one minor hit single in 1978; the following year she recorded another minor hit with "I'm Completely Satisfied With You," an electronically dubbed duet with her father who died in 1975. She began touring Nashville nightclubs and opened for a number of acts, including Jack Greene, Billy Thunderkloud and Jeannie Seely. She toured as a duet partner with George Jones and spent two years as part of the Opryland USA bluegrass show and as a regular singer on TNN's Nashville Now. In 1984, Morgan scored a minor hit with "Don't Go Changing." That year she became the youngest singer ever to join the Grand Ole Opry. Four years later, she signed with RCA Records, her first major label; her first album on that label, Leave the Light On, was released in 1989. In 1990, Morgan had her first number one single, "Five Minutes." Morgan's second album, Something in Red, was released in 1991 and went platinum. The same year, she married her third husband, Brad Thompson, Clint Black's bus driver. Watch Me, her third album, was released on RCA's newest label, BNA Records; it contained the number-one single, "What Part of No." Watch Me also was certified platinum, making Morgan the first female country artist to have three albums in a row to be certified platinum. Morgan's romantic life gained tabloid attention with Dallas Cowboys quarterback Troy Aikman. In 1994 she was voted "Female Vocalist of the Year" by the fans in TNN's Music City News Awards. She would earn this honor again in 1996, 1997 and 1998. Morgan also appeared on Frank Sinatra's Duets II album, singing a version of "How Do You Keep the Music Playing" intertwined with Sinatra's "My Funny Valentine." Morgan's Greatest Hits album, which produced her third and, to date, last number-one single in the song "I Didn't Know My Own Strength", was released in 1995. The next year, Morgan was featured on the Beach Boys' now out-of-print album, Stars and Stripes Vol. 1, performing a cover of their 1964 hit, "Don't Worry Baby." The Beach Boys provided the harmonies and backing vocals. Lorrie appeared on the 2006 album She Was Country When Country Wasn't Cool: A Tribute to Barbara Mandrell. Morgan's eleventh album A Moment in Time was released on October 27, 2009, on the Stroudavarious label. It features fourteen covers of traditional country songs. In December 2010, Morgan released her twelfth studio album I Walk Alone on iTunes and Amazon download. This was followed in 2014 by Dos Divas, a collaboration album with Pam Tillis. Morgan released a further solo album in 2016, Letting Go...Slow. In October 2008, Morgan filed for Chapter 7 bankruptcy, citing up to $10 million in liabilities while listing her own assets as valued between $500,000 and $1 million. Morgan, who has been married six times, is known for her turbulent personal life—she told Larry King in a July 2004 interview that "drama is something that lets you know you're still alive." She has a daughter, Morgan Anastasia Gaddis (born December 22, 1980) from her first marriage to Ron Gaddis, a former bass player in George Jones' band; they were married for only a brief time from 1979 to 1980. She has a son, Jesse Keith Whitley (born June 15, 1987) with her second husband, Keith Whitley. That marriage lasted from 1986 until his death in 1989. After that marriage, she had a lengthy involvement with Dallas Cowboys quarterback Troy Aikman. In 1991, she married Brad Thompson, the one-time bus driver for Clint Black; they divorced in 1993. "It was great to go out with an older man [Thompson] who was very successful on his own. . . . For a while, I enjoyed my first exposure to politics. It was interesting to hear about political conversations, and people even began talking about Fred as a potential president. . . . I put myself to the task of being a great companion to a stimulating and important man, and as a result I became boring. . . . I had to stop and think about the political implications of everything before I uttered a word in public. . . . For a while, I wanted to marry Fred, but I knew he could not accept me as I am." In 1996 Morgan married Jon Randall, a singer/songwriter now credited with writing the 2004 Brad Paisley/Alison Krauss hit "Whiskey Lullaby"; they divorced three years later. She married her fifth husband, singer Sammy Kershaw, on September 29, 2001. Morgan filed for divorce, citing irreconcilable differences on October 23, 2007. On September 15, 2010, Morgan married Tennessee businessman Randy White in a beachside ceremony. ↑ Bufwack, Mary A. (1998). "Lorrie Morgan". In The Encyclopedia of Country Music. Paul Kingsbury, Editor. New York Oxford University Press. pp. 357-8. ↑ "Country singer Lorrie Morgan files for bankruptcy". MSN.com music news. October 24, 2008. Retrieved 2008-11-11. ↑ "Larry King Live transcripts". CNN.com. July 5, 2004. Retrieved November 11, 2008. ↑ Lorrie Morgan with George Vecsey (1997). Forever Yours, Faithfully: My Love Story. Ballantine Books. pp. 262–263. ISBN 0-345-41297-4. ↑ "Country singer Lorrie Morgan files for divorce from Sammy Kershaw after 6 years". International Herald Tribune. October 27, 2007. ↑ Paxon, Bob (November 3, 2010). "Update: Lorrie Morgan Ties the Knot". countryweekly.com. Retrieved June 18, 2014. 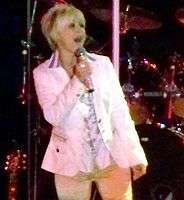 Wikimedia Commons has media related to Lorrie Morgan. "Back in Your Arms Again"
"Good as I Was to You"
"One of Those Nights Tonight"